You are designing a slideshow, and you want the background color to be a particular color from one of your images. Or, you are designing a web gallery, and you want the background color to be the color on your website, or some other cool color you have found. The question is, how do you find out what that color is, and tell Lightroom to use it? A while back I wrote a post on using Photoshop to identify the color, and then specifying this color in Lightroom. It turns out though, that there is an easier way — you can do it all within Lightroom. This is why I love Lightroom more every day — it just continues to surprise me! I will show you how to set a LR slideshow background color, and then I’ll talk about how to set other colors. If you want a color from a web page or another document, size your Lightroom window and your web browser or document window so that both are visible on your monitor. If instead you want a color from one of your images, have that image selected in the slideshow module. In the LR slideshow module, click on the color swatch next to Background Color in the Backdrop panel. This will open up the color palette. So here’s the secret: click inside the main color square (where the eyedropper is in the illustration above), hold, and drag the eyedropper out of the color palette and over into your image that you want to take the color from or your web page or other document. As you drag, you will see that the slideshow background color changes to reflect what you are dragging over. Let go when you have selected the color you want. That’s it! Notice that the color palette displays the Hex value of your color — if you want to use this exact color elsewhere, write down this hex value or copy it to the clipboard, and then type it in or paste it in elsewhere. Of course this doesn’t just work for a slideshow background color, it works for any color setting in LR where you see a color swatch that opens up to a color palette — all the color settings in Web, Slideshow and Print, as well as the Color setting on the adjustment brush! Open up Photoshop, open any image and make sure you have the background layer highlighted in the layers palette. 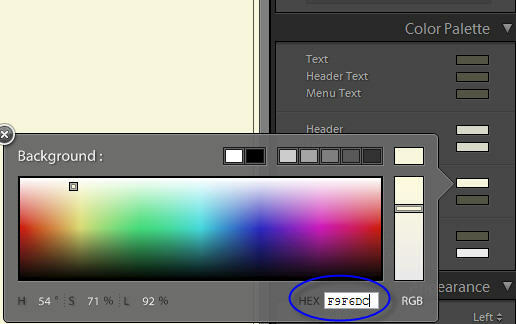 Resize the Photoshop window so that the web page (or any other document) you want the color from is next to it. Grab the Eyedropper tool (shortcut I), click anywhere in the image, and then drag over onto the web page color you want. As you drag around, you will see that the foreground color in Photoshop’s tool palette changes to reflect the color you are over. Let go when you have sampled the color you want. 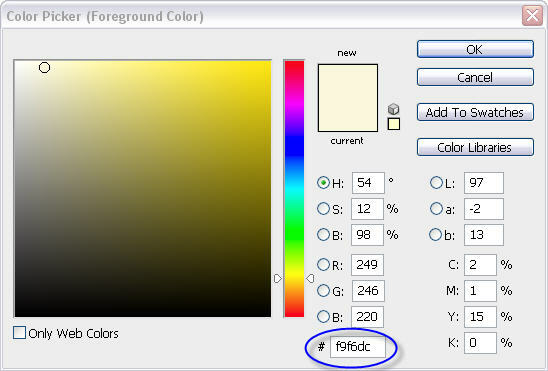 In the Web module Color Palette, click on the background color, and when the color dialog box opens, click in the hex box and type the new number in. That’s it! Once you have your web gallery designed, don’t forget to create a template, so that you can use the design again without having to start over from scratch. More on that in another post. Why Do I Have Question Marks on My Folders in Lightroom?